This most abundant member of the bedstraw family is a climbing annual and can reach a height of a metre or so. You will find it in hedgerows and growing upon riverside bushes throughout the UK and Ireland. 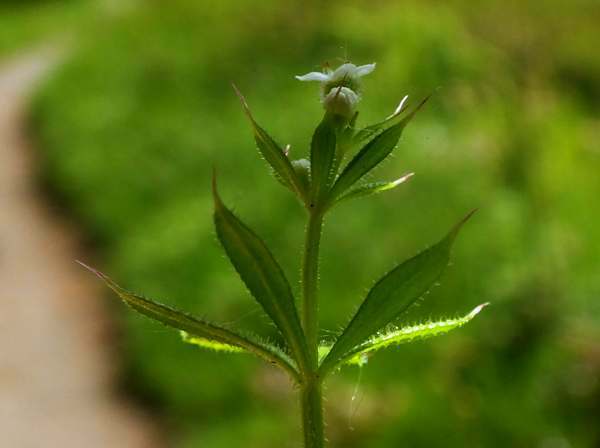 In early summer the tiny white flowers, rarely more than 2 mm across, are quite inconspicuous; however, once the seeds appear cleavers, or goose grass as it is also known, makes itself noticed by sticking to clothing and to animal furs. The fruits are covered with tiny hooked hairs, and it is mainly by animals that the seeds get dispersed. There are several other kinds of bedstraw in Britain, including heath bedstraw, lady's bedstraw, common marsh bedstraw and hedge bedstraw. From the common name of this family you are right to infer that at one time these plants were dried and used for making bedding. The plant on this page as photographed in West Wales in July.